The oldest surviving cast iron pier in the world is being reopened following a long restoration project. Grade II listed Gravesend Town Pier, in Kent, was originally opened in 1834. But the introduction of the railway at the turn of the century saw a decline in the number of vessels using the river and the pier fell into disrepair. 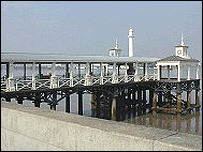 In 2002, Gravesham Borough Council began a restoration project funded by various grants, and on Thursday the pier will be officially reopened. As well as walking along the pier, people will be able to dine at the new restaurant and bar. When it was first built, many of the colonial settlers departed for their new lives from the pier, as did many of the crews involved in the early voyages of discovery.